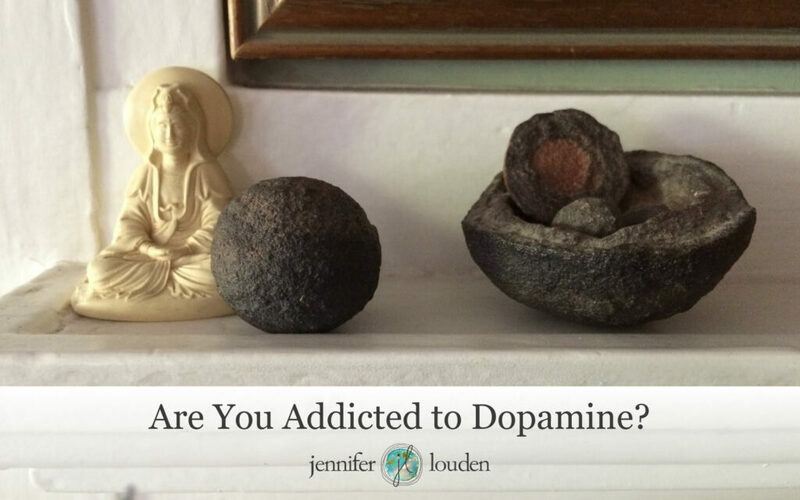 Are You Addicted to Dopamine? If you visit Facebook / Instagram / Pinterest / YouTube, do you keep scrolling and clicking — even when you want to stop? Do you ever find yourself fighting the urge to look at your smartphone while hanging out with people you love? Do you ever freak out at how long you can spend going down Internet rabbit holes? If so, you are not unique or weird or addicted. Your brain is wired to seek. That’s how our ancestors survived and evolved, by seeking – whether it was more camas roots, sharper knifes, or a safer cave to sleep in. Every time you seek, you get a dopamine hit. At first, that makes you feel great – smart, focused, even courageous – but too much of this functional neurotransmitter and you get that jangly, less-than, over-tired feeling. Yet even when you feel this way, you may find yourself watching yet another episode of Empire or spending another chunk of time playing Words with Friends. And then you may end up feeling crappy and mad at yourself. In a tiny too simple nutshell, much of current technology is designed to activate a dopamine loop. Unpredictability, instant gratification, auditory and visual cues (that sound your phone makes when a text comes in), learning something new (what everybody in your Facebook feed did Saturday night), anticipation, short informational bursts: all these trigger your seek/reward feedback loop. All of these factors combined make it very difficult to “just say no” and choose to work on your book, your business, or connect with another human. I have a bunch of ideas I’m sharing with the Oasis this month about how to work with this loop and one that I wanted to share with you today is something I learned from reading Taft’s article. It’s powerful medicine and it doesn’t cost a cent. The first moments I felt a bit jittery, a low strum of seeking. Soon a sweet whole body “ahhhhh” softened over me. I then tried to watch the snow “well,” as in do something. I felt waves of wanting to do and seek arise… where’s my laptop! !… and I just breathed… and did nothing. I wanted to share it with Bob, so after awhile I asked him to lie on the couch with me. That made it sweeter. There is something about doing nothing that can be scary. Of course, there are other ways you need to learn to manage this technological universe we find ourselves immersed in. Weekly digital sabbaticals are wonderful too, as is using a timer to measure how long you’ve been immersed, and Internet-blocking software is a godsend. I have friends who no longer have smart phones and friends who use old laptops with no internet connectivity to write on. Please do not, however, turn this into a good girl/bad girl dichotomy or technology is bad/doing nothing is good. That will send you toward what comforts you (Netflix, Candy Crush) and away from compassionate choice. Me, I’m reminding myself throughout my day that doing nothing is my friend and refuge. As the days warm up, I head for the chaise lounge outside my studio door and watch the clouds. I’m remembering how much I love legs-up-the-wall pose. I’m giving myself “bridges” between the dopamine loop and doing nothing – alternative nostril breathing, slow walk with the dogs, playing in my art journal. And most of all, lots of mercy.